21ST CENTURY ACTION AGAINST C.P.S. KNOWLEDGE-instilled per call-in session,from 1st call in. EDUCATIONAL-EMPOWERMENT- throughout while pro-se,as our founder's blueprint is clear. Such PRO-SE BLUEPRINT from the founder,has already demonstrated, just how she was under and against all odds, able to PROPERLY (key word is to PROPERLY commence suit pro-se self file by DEADLINE against child protection services, in a timely fashion,while you're still searching for lawyer.) WON NETWORK do not give any legal advice clearly discussed. )Always call lawyer for legal advice... Feel free to ask for a referral nationwide,when you're having your call-in session with our busy E-STAFF anytime. is not a lawyer as cited on per monitored-call in session, hence no legal advice is given per call-in session . Only a trained-lawyer can do that,hence keep calling lawyers to see if meanwhile, they will represent you. Keep fighting for what is right. for our many viewers who are suing cps, just like our founder has,and or others who are here today/tonight logged in online and reading our site(s) et.al,facebook,linkedin,space,twitter et.al, click on link in aforesaid or read in furtherance ,below for our full disclaimer(s)as already, prior expressed; per full disclaimer(s)disseminated throughout the internet,for which covers,each and every site,that was created by founder,and our online virtual assistant(s Ext. 806. StudentOnlineResearch, 1-on-1 empowerment,educational,chat-support(online)-Via Skype, Phone-in Ctr. @BellasOnlineResearch Ctr., WO.N. Bella'sLawStudent-Redress Innocence Project,for civil redress." Powerful_1 of a kind Interactive 1-on-1 e-chat ctr. "are not a lawyer." By accessing this website et.al. and all of our site(s)on the internet,you're agreeing by clicking on provide site/links et.al, he or she are acclimated with, and clearly understand,accepts the following WON Network and its affiliates Web-Blog and offline(online)et.al, clear written disclaimer. The information viewed on our website(s)external/internal links et.al.,facebook,linkedin, myspace,twitter et.al, does not in any way constitute ANY legal advice as also stated during our session,from first call in et.al.,ergo, our student research educational-empowerment 1-on-1 ctr., hence, cannot be held liable for actions arising from its use,and or view,nor be held responsible for the contents of any externally linked pages that you're coming across.“This disclaimer governs your use of our website; by using our website, you accept this disclaimer in full. Now, if you disagree with any part of this disclaimer, do not use our website,and log-out immediate. WON Network et.al., reserve the right to modify these terms at any time. ALWAYS everyone,seek legal advice,from the only person whose allow to share with you such legal advice representing you (your lawyer)+and or from a qualified lawyer. God speed to you all. Anyone whose able to research effectively & timely, shall be able to validate, that your right is clear when it come to suing on your own self file,pro-se by DEADLINE, and or procurement of a lawyer,against CPS. All information shared,compiled,per phone-in consult,per request,is given,protection under the 1st amendment,at our student online ctr.helpline weekly. Continue to search for a caring lawyer however, to represent you, as our founder has done and she finally met the right one.Ext. 806 She continued,coast-to-coast,while launching the first nationwide,1st of its kind Online-SPECIFIED-RESEARCH compilation ctr. 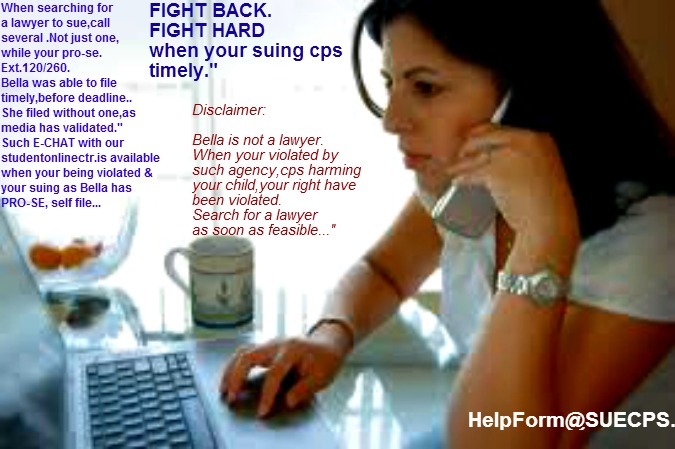 for those who,like her are suing timely by deadline (pro-se self file)cps. Thank you for your continued interest." 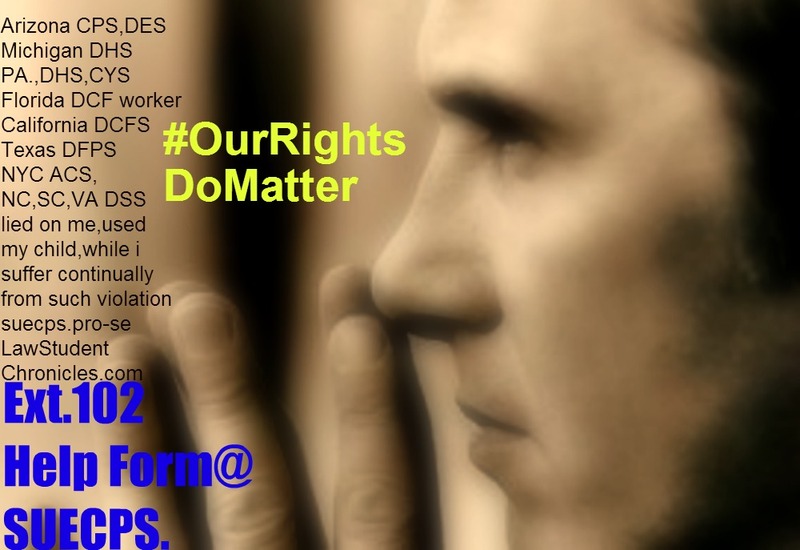 Rights of a loving parent,now terminated unlawfully,in violation of one's right, foster care abuse, ( a child,under age of eighteen) hospitaized,harmed, sexually abused,raped and or who has been continually-remove from the home, while knowingly by a caseworker,was being abused,under state cps worker supervision; & or whose been clearly violated through ongoing bullying,harmed,in state"care"and supervision" & tortured psychologically, wrongfully removed from such loving good parent,we invite attorneys as always to continue to call-in, for such referral data for those who were harmed. "We continue to add you to our StudentOnlineResearch@Bellas data, as a referral.